It’s not a secret to anyone, I love this man, it’s my crush, if I could marry him I would. But I’m not here to tell you about my love for him (that would take a lot of time and I don’t want to bore you), but I do want to tell you about my love for his style. Many will say; “WHAT ?, THIS GIRL SURE IS CRAZY” Well yes, I’m crazy. Returning to the seriousness of the subject. Sometimes he may be a bit extravagant to dress, but always looks impeccable, from fresh out of the gym to a red carpet. You will say, is a man, how can he be your inspiration when dressing?. I do not know. But everything started with his famous brown boots; I have to admit that I had never liked boots, I had never used a pair of boots until a couple of years ago and now they have become a “must have”; but it is because I saw him constantly using them and how well he adapted them to his outfits… persuasion guys persuasion, sometimes those kind of things happen. From him I learned to use basic. Yes yes all that philosophy of less is more and that the basics are indispensable is for that love I have for Harry Styles’s style. Thanks H. for the tip! Now I leave you with some styles I like the most from Harry and how I adapt them for myself. Calvin Klein is a brand that I have always liked, their basic pieces always simplify your life when dressing, in addition there are many celebrities, bloggers, yotubers …, who can serve as reference and give you ideas when it comes to wear the clothes of this brand. As Harry shows us in this style, a good Tshirt and a good pair of black jeans is enough. Looking good, effortless! I must say that this is my favorite, it’s totally my style, I love the wide trousers, and I hightly recommend them. Wide trousers stylize your figure automatically, making you look so much taller, in my case I am tall and wearing this type of pants makes my legs look even more infinite; If we add to that the fact of being hight waist and striped ufff! the perfect combination. Tell me, who’s your fashion icon? No es secreto para nadie, amo a ese hombre, es mi crush, si pudiera casarme con él lo haría. Pero no estoy aquí para hablarles de mi amor por el (eso tomaría mucho tiempo y no quiero aburrirlos), pero si quiero hablarles de mi amor por su estilo al vestir. Muchos dirán; “¿WHAT?, ESTA TIPA DE SEGURO ESTA LOCA” pues sí, algo de loca tengo. Volviendo a la seriedad del tema, puede que, sí a veces sea un poco extravagante al vestir, pero siempre se ve impecable, desde recién salido del gym hasta en una red carpet. Ustedes dirán, es un hombre, como puede ser tu inspiración al vestir. No lo sé. Pero todo empezó con sus famosas botas color café; tengo que admitir que a mí nunca me habían gustado las botas, jamás había utilizado unas hasta hace un par de años atrás y ahora se han convertido en un must have; pero es que tanto lo veía con esas botas, y lo bien que las adaptaba a sus outfits que me persuadió, a veces esas cosas pasan y no se pueden evitar. De él aprendí a usar básicos. Si si si toda esa filosofía de menos es más y que los básicos son indispensables es por ese amor que le tengo al estilo de Harry. ¡Gracias H. por el tip! Ahora los dejo con alguno de los estilos que más me gustan de Harry y como los adapte para mí. Calvin Klein es una marca que siempre me ha gustado, sus piezas básicas siempre te simplifican la vida a la hora de vestir, ademas de que hay muchos famosos, bloggers, youtubers…, que te pueden servir de referencia y darte ideas a la hora de vestir las prendas de esta marca, así como Harry nos lo demuestra en este estilo. Un buen Tshirt y un buen par de jeans negros. Sin mucho esfuerzo lucirás bien. 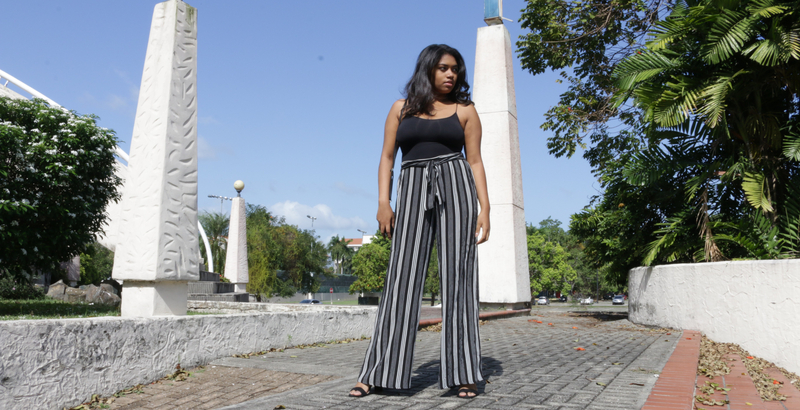 Debo decir que este es mi preferido, es totalmente mi estilo, yo amo los pantalones basta ancha, y se los recomiendo al 100 %, los pantalones basta ancha te estilizan la figura automáticamente te hacen lucir mucho mas alta, en mi caso yo soy alta y el usar este tipo de pantalones hace que mis piernas se vean aun mas infinitas; Si a eso le agregamos el hecho de ser hight waist y con lineas verticales ufff! la combinación perfecta. Inténtelo y me cuentan. Coméntame; ¿Qué famoso es tu referente en la moda? Previous STAY ORGANIZED|No le debas nada a nadie. Wao!! This is so nice.